Hey Missa Gregoriana em Portugal guy, I don't know how else to reach you, but please take my blog off your automatic blog-roll. Every single post I do gets six or seven links to your blog and it's mildly irritating since the links are all in Portuguese. If you choose to link to my blog, please do it manually, but take me off your blog-roll. To those of you who subscribe to this blog, sorry for the useless post. This post is really not about Gandhi; rather, it is using Gandhi as an example of a lot of what is wrong in the way a lot of Christians are thinking today regarding the Church's perennial teaching on the reality of hell as well as the abuse of the concept of invincible ignorance. 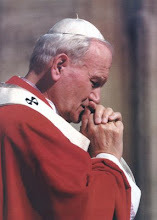 According to the manner in which the doctrine of invincible ignorance is popularly (and errantly) understood in the Catholic Church, those who are ignorant of the Gospel and Christ's Church in such a way that it is "not their fault" that they have not heard are not guilty of their sins and we can safely presume that will go on to heaven, saved, as it were, by their ignorance. Thus, we need not worry ourselves about Hindus, African bushmen, the natives of the Amazon or the Muslims, because so long as it is "not their fault" that they do not know Christ, we can presume salvation. This is, of course, an errant interpretation of the concept of invincible ignorance, an idea that is contrary to two thousand years of tradition and something that undermines the missionary impulse of the Church. It leads to things like Mother Teresa's nuns visiting Hindu temples for prayer instead of evangelizing the Hindus, the Columban missionaries having "role playing" sessions with Muslims and teaching that all religions lead to God, and the Trappist monks of Tibhirine, Algeria praying with Sufi Muslims instead of trying to teach them about Christ (they were rewarded for their interest in Islam by being beheaded, by the way). I don't know if in any of these cases the concept of invincible ignorance was cited specifically, but we cannot deny that an ecclesial culture that keeps tossing around this concept is going to breed these sorts of abominations. As an interesting aside, evangelicals have an interesting answer to the question about what happens to remote natives and persons who never heard of Christ. They basically say, "If anyone of them is open to the truth, God sends them a missionary. If they never hear of Christ and nobody comes to them, it is because God knows they will not listen. Thus, they are without excuse, even if they have never heard."St. Thomas and St. Augustine seem to have opined similarly, though neither taught this as definitive as far as I can tell. I don't know that we can always presume that God will work this way; Ezekiel 33:6 states that when a righteous man fails to warn sinners of their plight and the sinners perish, it is the righteous man who is guilty for not spreading the word: "And if the watchman see the sword coming, and sound not the trumpet: and the people look not to themselves, and the sword come, and cut off a soul from among them: he indeed is taken away in his iniquity, but I will require his blood at the hand of the watchman." Irregardless of whether or not those in true invincible ignorance are saved, Scripture is clear that if they are not reached by the Gospel, it is our fault. I don't think it is responsible to just write them off and say, "Well, if they never heard it is because God knew they wouldn't listen." But this is a digression. 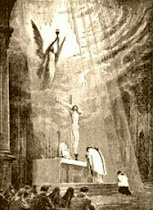 The Catechism says this on invincible ignorance: "Those who, through no fault of their own, do not know the Gospel of Christ or his Church, but who nevertheless seek God with a sincere heart, and, moved by grace, try in their actions to do his will as they know it through the dictates of their conscience - those too may achieve eternal salvation" (CCC 847), quoting Lumen Gentium 16. It must be understood that this is not "another way" to salvation outside of Christ; the Catechism is stating that some may "stumble" into salvation through Christ ignorantly, but just not be cognizant of it, much like the Calormene at the end of C.S. Lewis's The Last Battle. There is only one door, but some may enter through it even if they don't realize it. So the Catechism at least says that salvation is possible for those in invincible ignorance, but does not by any mean state it as a given. Invincible ignorance is originally a premise in moral theology that has been transplanted to soteriology. 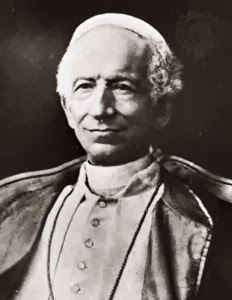 The Catechism mentions it in this context in paragraph 1793 regarding culpability for moral actions: "If...the ignorance is invincible, or the moral subject is not responsible for his erroneous judgment, the evil committed by the person cannot be imputed to him. It remains no less an evil, a privation, a disorder. 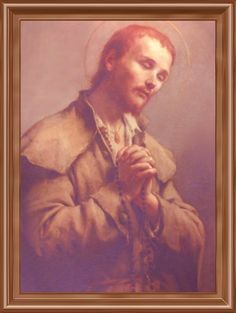 One must therefore work to correct the errors of moral conscience" (CCC 1793). So one can be innocent of the sin of unbelief but still be guilty of a host of other damnable sins, first among them idolatry, but also theft, adultery, fornication, lying, etc. Therefore, being invincibly ignorant of salvation does not in any way "secure" salvation - it merely means you can't be imputed with the guilt of the sin of unbelief. 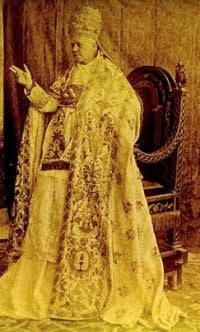 It is in this context that Pope Pius IX said, "It is equally certain that, were a man to be invincibly ignorant of the true religion, he would not be held guilty in the sight of God for not professing it" (Pius IX, Allocution of December 9, 1854). He speaks here only of the guilt of not professing the true Faith, not he guilt relating to sins against the natural law. "Unbelief has a double sense. First, it can be taken purely negatively; thus a man is called an unbeliever solely because he does not possess faith. Secondly, by way of opposition to faith; thus when a man refuses to hear of the faith or even condemns it, according to Isaiah, "Who has believed our report?" This is where the full nature of unbelief, properly speaking is found, and where the sin lies. If, however, unbelief be taken just negatively, as in those who have heard nothing about the faith, it bears the character, not of fault, but of penalty, because their ignorance of divine things is the result of the sin of our first parents. Those who are unbelievers in this sense are not condemned for the sin of unbelief, but they are condemned on account of other sins, which cannot be forgiven without faith” (Summa Theologica II-II, Art. 10 Q. 1). 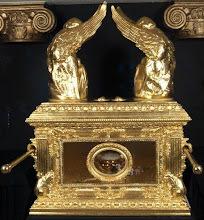 "Since therefore we are the offspring of God, we ought not to think that the divinity is like an image fashioned from gold, silver, or stone by human art and imagination. God has overlooked the times of ignorance, but now he demands that all people everywhere repent because he has established a day on which he will 'judge the world with justice' through a man he has appointed, and he has provided confirmation for all by raising him from the dead" (Acts 17:29-31). Note that the call to repent is for "all people everywhere." This is totally contradictory to the creeping universalism within the Church which seems to optimistically believe that, not only those who are invincibly ignorant, but even Muslims and Jews will be saved without converting so long as they are "good people." "It was more than I could believe that Jesus was the only incarnate Son of God, and that only he who believes in Him would have everlasting life. If God could have sons, all of us were His sons. If Jesus was like God, or God Himself, then ...all men were like God and could be God Himself. My reason was not ready to believe literally that Jesus by His death and by His blood redeemed the sins of the world. Metaphorically there might be some truth in it .... I would accept Jesus as a martyr, an embodiment of sacrifice, and a divine teacher, but not as the most perfect man ever born. His death on the cross was a great example to the world, but that there was anything like a mysterious or miraculous virtue in it my heart could not accept" (Mahatma Gandhi, Gandhi An Autobiography: My Experiments with Truth, pp. 170-71). If anything is clear from this passage, it is that Gandhi was emphatically not in any ignorance about Christianity, Jesus or the central beliefs of the Christian Faith. He knows enough about Christ to paraphrase the Gospel of John at the top of the passage and to understand the Christian concept of Christ being God's "incarnate" Son. He knows Christians believe that "His death and blood redeemed the sins of the world." He understands very well the Christian idea of Jesus' death being unique and atoning. Based on this, we can hardly call Gandhi ignorant, let alone invincibly ignorant. Gandhi knows Jesus' claims to lordship but will not accept them; as a teacher, as a martyr perhaps, but not as Lord. He understands the tenets of Christianity perfectly well and yet consciously chooses to reject them. Let us remember that the word "invincible" literally means "unconquerable." Gandhi was raised among Christians in British India and his ignorance can hardly be said to be unconquerable. "But," it might be said, "perhaps the example of Christianity he was given was so poor that it spoiled any chance of him ever believing." Well, if we take this line of reasoning then basically every person on the planet is invincibly ignorant unless someone as perfect as Christ Himself comes to preach to them, since we could always cite sins or faults on the part of the one presenting the Gospel. Secondly, Gandhi did not say he rejected Christianity because of Christians (although he was not impressed with the Christians he met), but because he could not accept the message of Christ. 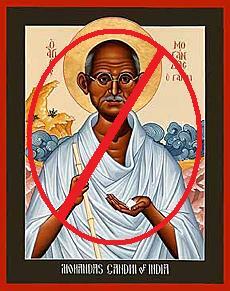 It was Christ that Gandhi rejected, and did so quite openly and deliberately. By the way, even if Gandhi was in "invincible ignorance", it would mean only that he was incuplable for the sin of disbelief, not for any other sins. 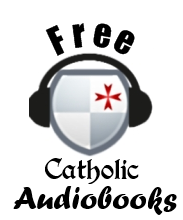 Some Catholics assert that it is impossible for those in invincible ignorance to be saved. 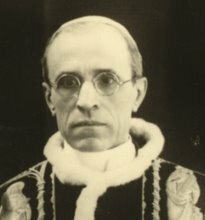 Following the Catechism and Lumen Gentium, I have to at least admit the possibility, though as opposed to modern, progressive Catholic universalism, I must insist that the criteria for this be understood as narrowly as possible, and that we do no more than admit the possibility without asserting salvation in any specific cases. We should certainly never, ever, ever engage in any of the nonsense like making icons of Gandhi, as we see at the head of this post. In my opinion, those who are in a state of invincible ignorance are few and far between. And even if they are not guilty of unbelief, this does not mean they are not guilty of a host of other sins, much less that they do not need the message of Christ preached to them. Is Gandhi in hell? Of course, there is no way to know; I can admit the possibility of a hypothetical last-minute, interior conversion known only to God alone. But barring that, and knowing how Gandhi thought about Jesus, I think it is an insult to the Gospel to suggest that such a man could gain heaven just because of his social and political activism while ignoring the insulting things he said about Jesus and the Church. The differences among the thirty-eight leaders participating in the Evolutionary Christianity tele-series are important to the group. One section of the website divides them into categories that include two Nobel Laureate scientists, two Templeton prize-winners, and a soup of thinkers speaking about process theology, the “emerging” church, eco-theology, progressive and integral Christianity, and evolutionary Christian mysticism. Four of the thirty-eight identify themselves as Evangelicals and six as Roman Catholics. The labels aren’t particularly useful, as one might reasonably argue that all participants embrace the “inclusive” philosophy of Evolutionary Christianity and are therefore coming from a similar perspective. It is basically a Teilhard de Chardin fanclub. The better known in the group are Matthew Fox, a Roman Catholic priest who switched to Episcopalianism in the early 1990s after being expelled from the Dominican order for teaching Creation Spirituality; Sr. Joan Chittister, a Benedictine religious who has participated in the dissenting movement Call to Action and is an advocate of women’s ordination; John Shelby Spong, homosexual Episcopal bishop emeritus who has called for a new Reformation to reformulate basic Christian doctrine “[s]ince God can no longer be conceived in theistic terms…;” and perennial new age heretic Father Richard Rohr, a Franciscan who, over the years, has promoted a host of programs that make one wonder why he calls himself a Catholic at all. Father Rohr is not so much an originator of these programs (among them the Enneagram and male spirituality) as a brilliant popularizer of them, able to articulate their complexities and make them available to wide audiences. Therefore, as an introduction to some of the ideas espoused by the proponents of Evolutionary Christianity— at least as they will be sold into Catholic circles—it is profitable to take a closer look at Father Rohr’s interview with Michael Dowd, the evangelical minister who founded the Evolutionary Christianity project. Interview of Fr. Richard Rohr by Michael Dowd, Dec. 18th, 2010: " Radical Grace and Evolutionary Spirituality"
Father Rohr begins the interview with a bit of personal background, explaining that the mission of his Albuquerque-based Center for Action and Contemplation (CAC) is to help people on both the right and left to transcend the dualistic thinking that divides the world into “bad guys” and “good guys.” The contemplative mind, he argues, rejects that dualistic thought. "Again and again," says Fr. Rohr, "I saw the tremendous social needs of our time and our world. And yet, to be perfectly honest, I often was disappointed in some of the responses, which I would now call “dualistic thinking”…“either/or thinking”… “all or nothing thinking.” I found dualistic thinking to be as much on the left as it was on the right. Different vocabulary, but such thinking still split the universe into the good guys and the bad guy — totally right or totally wrong." Dowd interjects that the contemplative mind is “non-dogmatic.” Father doesn’t correct that description but develops the idea that the spirituality of youth, whether in individuals or institutions, is engaged in creating a self-identity – a container. The spirituality of age is more concerned about what’s in the container, such as patience, inclusion, and the forgiveness of reality for not being perfect. God, Rohr says, is comfortable with a diversity that follows different sets of rules. That’s creative and is the sort of thinking that allows one to be compassionate and forgiving. "The race of man, after its miserable fall from God, the Creator and the Giver of heavenly gifts, "through the envy of the devil," separated into two diverse and opposite parts, of which the one steadfastly contends for truth and virtue, the other of those things which are contrary to virtue and to truth. The one is the kingdom of God on earth, namely, the true Church of Jesus Christ; and those who desire from their heart to be united with it, so as to gain salvation, must of necessity serve God and His only-begotten Son with their whole mind and with an entire will. The other is the kingdom of Satan, in whose possession and control are all whosoever follow the fatal example of their leader and of our first parents, those who refuse to obey the divine and eternal law, and who have many aims of their own in contempt of God, and many aims also against God." To say that conceiving of the world in terms of right and wrong, true and false is dualism is a foolish misunderstanding of what dualism is. But I digress. Father answers: "It’s become almost foundational. If what’s happening is evolving, then of course you’ve never got it. So an evolutionary understanding keeps you with a beginner’s mind. It keeps you with that kind of humility — an expectation of an open horizon. I think the bane of religion, and not just Christianity, has been a closing down of such openness way too early, because of the assumption that ‘I understand; I know.’ And I think this is the arrogance that so many people have come to resent in religious people." The “evolutionary understanding” of reality, which Dowd defines as science-based understanding, may believe that what has been revealed by God about Himself may evolve to “reveal” something quite different – say, that the personal One, Creator God of yesterday is today revealed to be the universe itself - is as much an “I understand; I know” position as any other. Knowing certain truths, however, doesn’t mean one has exhausted their meaning nor does rejecting what little one can know guarantee freedom from arrogance. Having true knowledge about a thing does not mean we have come to the end of the mystery. "The mystery of the Enfleshment of Spirit began 14.5 billion years ago, approximately. That’s the real birth of Christ. When I say that to Christians, they’re shocked. So I point them to the prologue to John’s gospel and to the hymn in the beginning of Colossians, the hymn in the beginning of Ephesians, the first chapter of the first letter of John. These passages all say, without any equivocation, that Christ existed from all eternity." Is he serious? Does he not understand what the Incarnation is, or does he not know the difference between our Lord's eternal preexistence and His coming as a man in time? To say that Christ existed from all eternity isn’t to say that he was enfleshed from all eternity. Nothing in the scripture passages mentioned, or in any other scripture passages for that matter, suggests that he was; quite the contrary, scripture is clear that he existed before creation. (Col 1: 15-20). "So to get to your notion of deep time, you’re right on. Deep time is not just taking my moment as if it’s the reference point — the be-all and end-all. Rather, I must look to how I fit in to past and future. How am I connected to this universal history, this geological history, this history of civilization? How do I situate myself inside of all of that history? This seems to me to be the real appreciation for incarnation. Incarnation is planted inside the very nature of the world that God created and through which God is revealing God’s self in every creature. Every creature is a word of God. St. Bonaventure was a philosopher. He took the experience of Francis and made an entire philosophical system out of it, in which he made the point that every step of creation and every piece of creation is another word of God. Each is another footprint, another fingerprint, another revelation of the mystery. So the whole distinction between sacred and profane just doesn’t work anymore. It’s not helpful. It’s not true. There is only one universe. It’s all sacred, and it’s all revealing the divine." The confusion of God with His creation as expressed by Father Rohr, has been addressed by the Vatican document on the New Age, Jesus Christ the Bearer of the Water of Life: “For New Age the Cosmic Christ is seen as a pattern which can be repeated in many people, places and times; it is the bearer of an enormous paradigm shift; it is ultimately a potential within us. According to Christian belief, Jesus Christ is not a pattern, but a divine person whose human-divine figure reveals the mystery of the Father's love for every person throughout history (Jn 3:16); he lives in us because he shares his life with us, but it is neither imposed nor automatic. All men and women are invited to share his life, to live “in Christ” (3.3). Later in the Vatican document, some brief formulations about New Age thought are detailed, including the idea that the “new consciousness” – sounding rather like the “evolutionary understanding” above – “demonstrates itself in an instinctive understanding of the sacredness and, in particular, the interconnectedness of all existence. This new consciousness and this new understanding of the dynamic interdependence of all life mean that we are currently in the process of evolving a completely new planetary culture” (7.1). At one point in the interview, Dowd says that his dualism collapsed when he realized the universe had started to become conscious of itself (though he doesn't explain how this is evident in anyway). Rohr responds that when one isn’t operating on the mystical level, all one is left with is a "low-level morality." "If God is Trinity, then God himself, herself, itself is relationship. This is my foundation — that God is not a noun. God is a verb. God is an eternal circle dance. The Cappadocian Fathers in the third and fourth century said this — that God is a circle dance. Once that becomes your template for the very shape of the divine, and therefore the very shape of creation, then there’s nothing that can be understood outside of relationship." "God is an eternal circle dance." I'm not sure if the Cappadocians ever said that, but even if so, that phrase used in this context makes me want to puke. In that "circle" relationship, then, Rohr argues, one is not believing things or judging things but simply participating with “the mystery” and honoring the divine expression in all people, because humanity’s survival depends on not excluding one another with sectarian “truths.” The new, emergent, participatory religion is entirely inclusive, rejecting a Jesus who is the exclusive son of God for an inclusive son of God. Rohr quotes Thomas Merton as saying that if this is the sacred dance, it’s always the general dance and if you’re not in the general dance you’re not in it. If you’re compassionate only for your own self, or your own group, you’re not compassionate. "Compassion can’t be just for my group or my political party or my baseball team or my religion.That’s the very thing Jesus was critiquing in his own Jewish brothers and sisters. So I say, “Why was Jesus inclusive in his lifetime, and then afterwards we created an exclusive religion in his honor?” It doesn’t make a bit of sense." Even “truth” must be inclusive, it seems, encompassing contraries and contradictions. Dowd remarks that one can’t expect everyone to have all the truth but everyone has something useful to offer, even atheists who help others to evolve their own religious expression. Father Rohr develops that thought, adding that religious people can’t build on their superiority but must build on commonality of humanity. "There are billions of us on this planet. If we can’t start honoring the divine presence in all people, all religions, and all things, I don’t know what hope there is for the world." As indebted as Father Rohr and his cohorts may be to the thought of Teilhard de Chardin, its roots go much deeper. Rather than being an evolutionary step in religious thought, if one considers evolutionary steps to be progressive, positive developments, Evolutionary Christianity is constructed from quite ancient ideas, such as incarnated by the Hindu greeting “Namaste,” meaning the divine in me greets the divine in you. Not that this fact would bother an Evolutionary Christian. These people seem positively proud of their pagan associations. I know that Catholics are free to believe in evolution if they want, but it is interesting to me that the folks who are on the cutting edge of promoting evolution within the Church, people like Rohr and de Chardin (and Fr. Ron Rohlheiser, too, for that matter), are always huge heretics and progressives as well. In my opinion, this is what you get when you start mixing evolution up in your theology. Thanks to the Los Pequenos Pepper, who did most of the research for this and where most of this post was lifted from. Tomorrow is Ash Wednesday and the beginning of the penitential season of Lent. May you all be richly blessed as you turn towards the Lord in humility, recalling that we are but dust and ashes, and that absolutely everything is grace. Check out this post from 2008 on how Ash Wednesday is one of the highest attended liturgies of the year due to the fact that people "get something" when they come to Mass. Sigh. Apparently my comment in my previous post that the liberal arts are "useless' have scandalized a few persons, so if you all will indulge me on this topic one last time, I will endeavor to explain what I mean when I say that the liberal arts are "useless." What I hope to get through is that, though the liberal arts may be "useless" to a degree, they are not valueless, as to have value and to have usefulness are not the same thing. First, let's go back to the beginning, to the definition of the terms we are talking about: What are liberal arts? 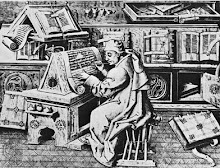 If we start with etymology, we see that the word 'liberal" in liberal arts derives from the Latin word liber, which means free. The primary context of the original Latin meaning is free in the sense of politically free, as opposed to a slave or freedman. The liberal arts were those disciplines which it was considered fitting for free men to study, men who would have to be well-formed human beings in order to responsibly take up the burdens of representative government in the ancient world. Thus, a "free" man was encouraged to study philosophy, literature, history, geometry and the like while servants or slaves would obviously not, both because they did not have the time, and because to the degree that they specialized in anything, it was in menial tasks. Sometimes free men wrote treatises on manual tasks, like horticulture, husbandry and cattle breeding, but only because these agricultural pursuits were seen as fitting for free men. So liberal was originally contrasted to manual, just as free men were to slaves. Thus, the liberal arts were for free men of the higher classes; in the classical dichotomy between practical and theoretical, the liberal arts were certainly not practical. Later, the phrase "liberal arts" came to take on another connotation. Besides the idea of political freedom, the term came to mean free in the sense that the liberal arts were ends in themselves; i.e., they were "free" from being put to utilitarian ends. For example, an architect will put the skills he learns to work building bridges, houses or other structures of practical usefulness. An electrician will take the electrical-working skills he learned as an apprentice and put them to practical use in the actual wiring of homes. One who studies history or philosophy, however, does not later put his knowledge to "work" for any practical or utilitarian ends. The sole purpose of such education is simply to educate the learner and make them a more perfect human. The liberal arts are thus free also in the sense that they are free from being put to utilitarian uses. This means that, by their very definition, the liberal arts are indeed "useless" in the truest sense! We could phrase it this way: liberal arts were never meant to be studied for the end of making people money; they were studied by people who already had money. They were never meant to make a living; they were the course of study for those who already had a living. They were never meant to be put to use because they were studied by those who had no need to go into any "useful"trade. This does not mean that a liberal arts education has no value. On the contrary, it is of immense value in forming the person, acquainting one with the greatest treasures of civilization and teaching one how to think. But, because they are not ordered towards any utilitarian or vocational end, a liberal arts degree is not likely to make its recipient much money. In this sense a liberal arts degree is "useless" as far as earning potential goes. There is one exception to this, of course, and that is unless you are actually going to be a literature professor or a history professor. In this case, you are studying the liberal arts for the purpose of teaching the liberal arts to others, in which case the degree would be "useful" to one's career. But the problem with so many Catholics going to liberal arts colleges is that not all of them are intending to go on to be professors of literature or philosophy; many do not know what they want to do in life. They just go off to get their liberal arts degree, imagining that their job opportunities are going to be better after getting it. To some level this is true; any degree looks better than no degree. But, comparable to how much money they are likely to spend attaining that degree, it is unlikely that they will get a job whose pay is commensurate with the debt they are likely to incur. I know of many people with liberal arts degrees who do not make in one year what it cost them for their education, which is disappointing since most people go to college with the intent of at least having a modest increase in their earning potential. Absolutely all Catholics should be educated in the liberal arts. This is essential. The liberal arts teach one, not only knowledge, but how to acquire knowledge for oneself. The liberal arts, more than any other field of study, equip one to be a self-directed learner. This is the end goal of all education: not to teach a subject, but to teach others how to teach themselves. But, unless one is planning on becoming a professor of the liberal arts themselves, and given the tremendous cost of college, I do not think Catholic kids ought to choose the liberal arts as a major. It is best taught during the high school years, in order that they may already have this liberal arts template over which they can view everything else they learn college. Teach the liberal arts? Absolutely without a doubt. Spend $40,000 and four years of your precious life getting a degree in them that will not give you an adequate return on your investment and for which you could have gotten the same knowledge for free by reading some books? That arrangement should give us pause, and that is all I have been saying.